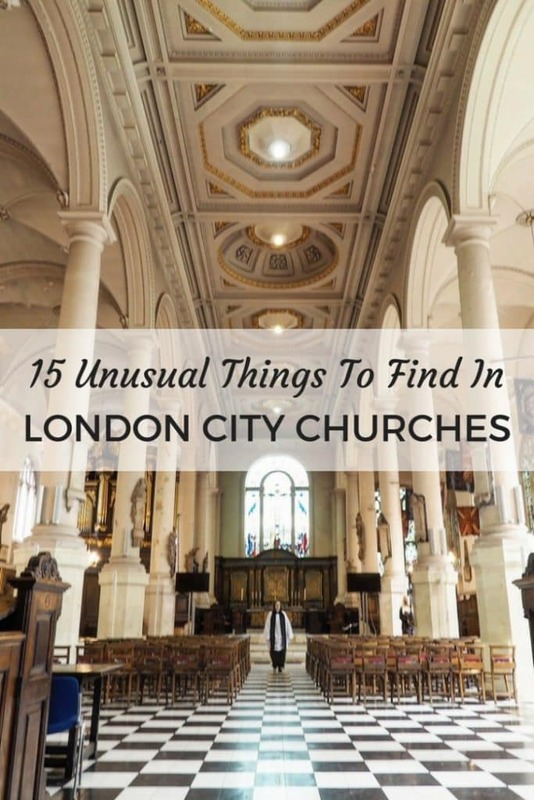 There’s an incredible 47 churches within London’s square mile. 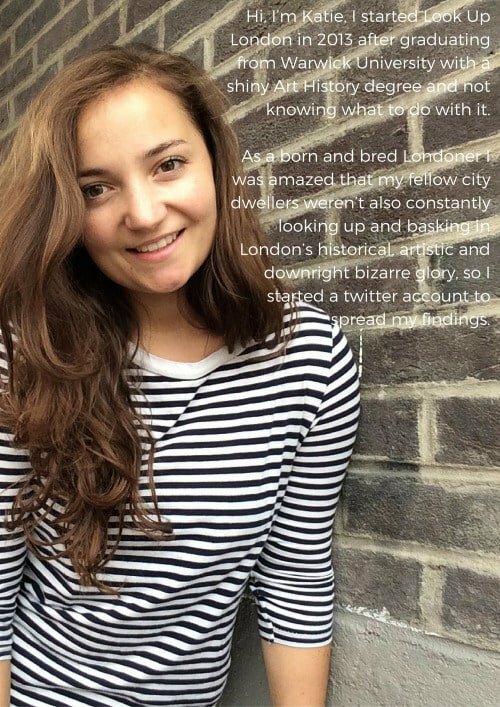 Each with their own history and often some special quirk up their sleeve. 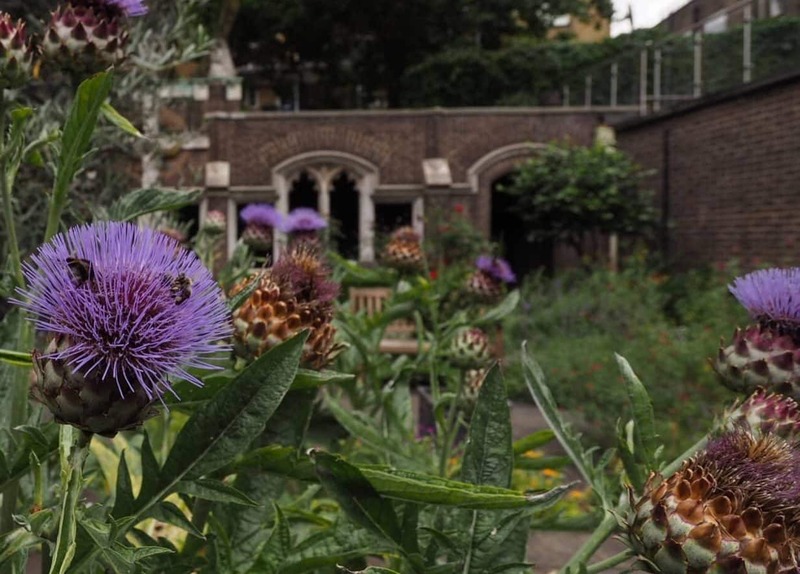 From ancient relics to pop-up gardens and cutting edge sculpture to 17th century shoes, there’s plenty of surprises to be found inside London City Churches. London’s notorious prison, Newgate, was demolished in 1902. 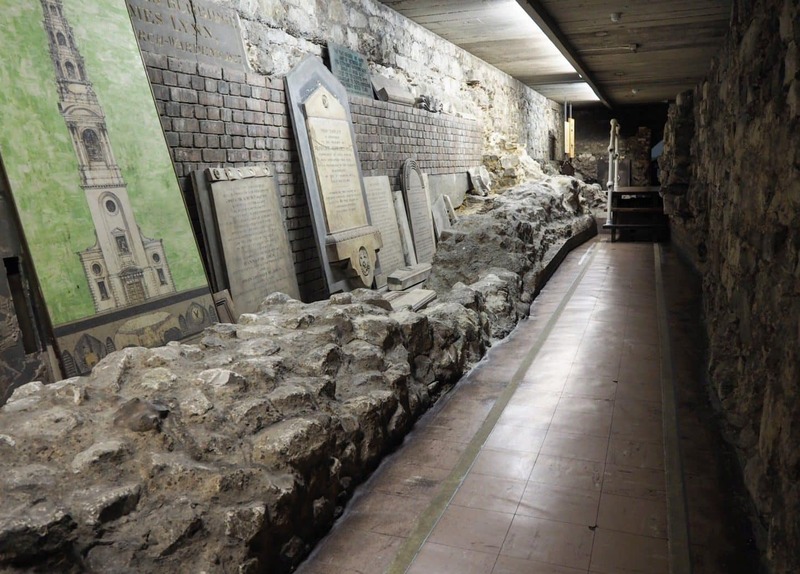 You can still see a section of the wall (with a City of London square blue plaque) but a more harrowing reminder lies inside its neighbouring church. 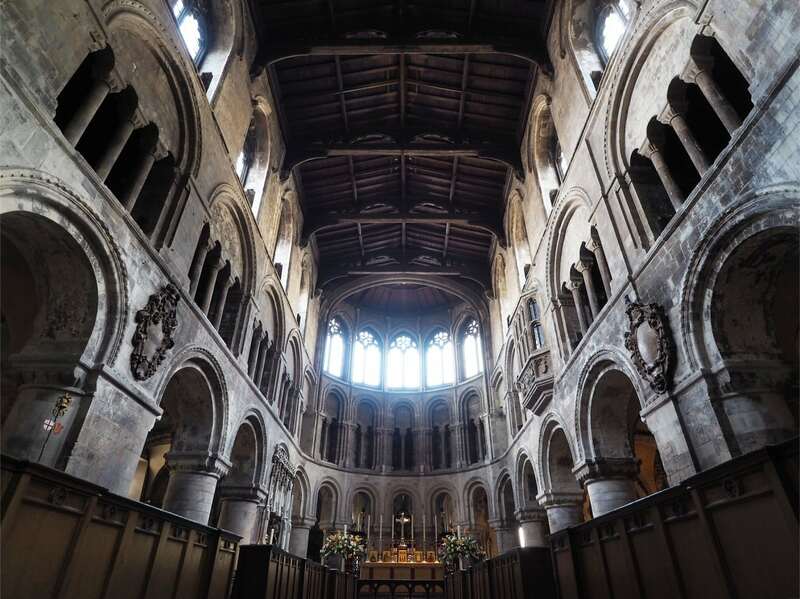 First recorded in 1137, it was rebuilt in the 15th century but gutted in the Great Fire of London. 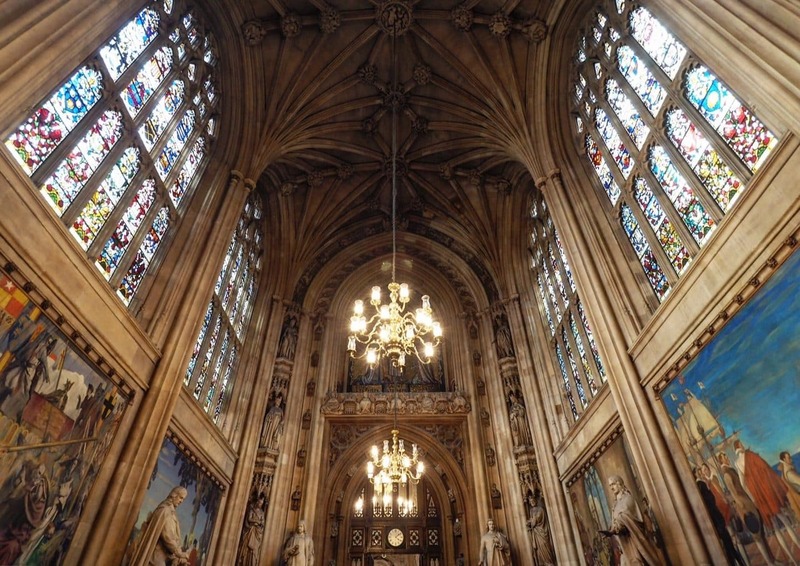 Rebuilt in the 19th and 20th centuries it was relatively unscathed by The Blitz. 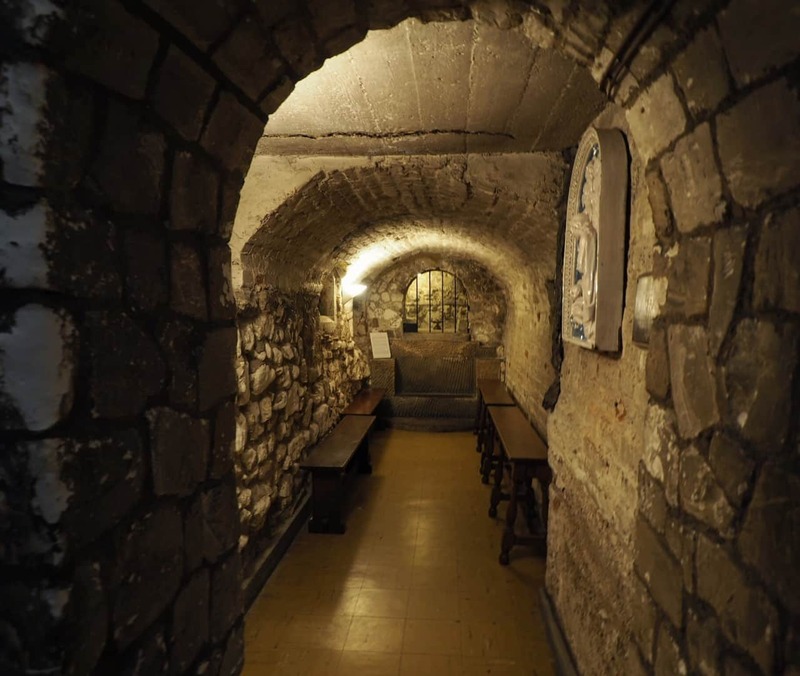 The church used to be connected – via tunnel – to the prison and in 1605 Robert Dowe left £50 so that a man could pass through the tunnel and perform a particular pre-execution ‘ceremony’. 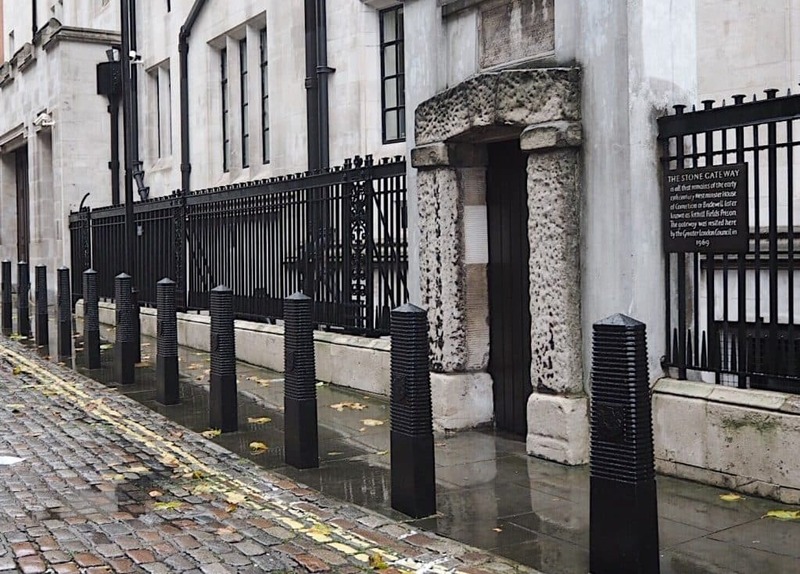 A church officer would pass through the passageway and, when he reached the cells, would recite a proclamation on the night before you faced your fate at Tyburn (Marble arch today). 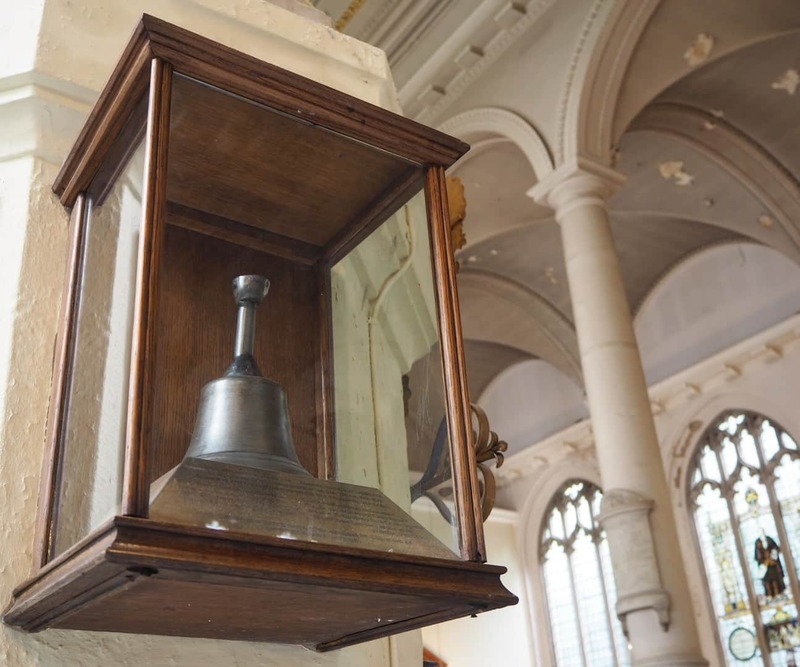 To accompany this speech there would be 12 chimes from the handbell at midnight, a kind of death knell that aimed to persuade the condemned to repent their sins. When I see the preserved bell today it never fails to send a shiver down my spine! 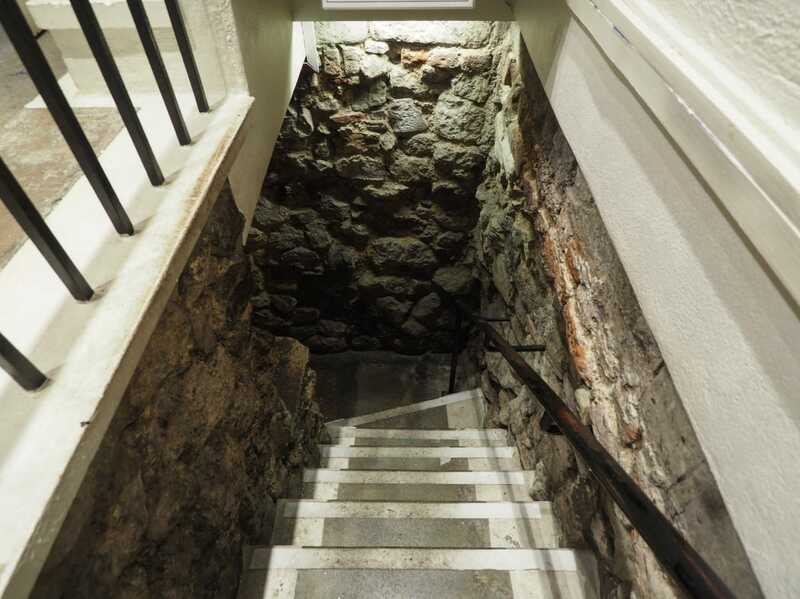 An unassuming bit of stone stands out amid the wood paneling. 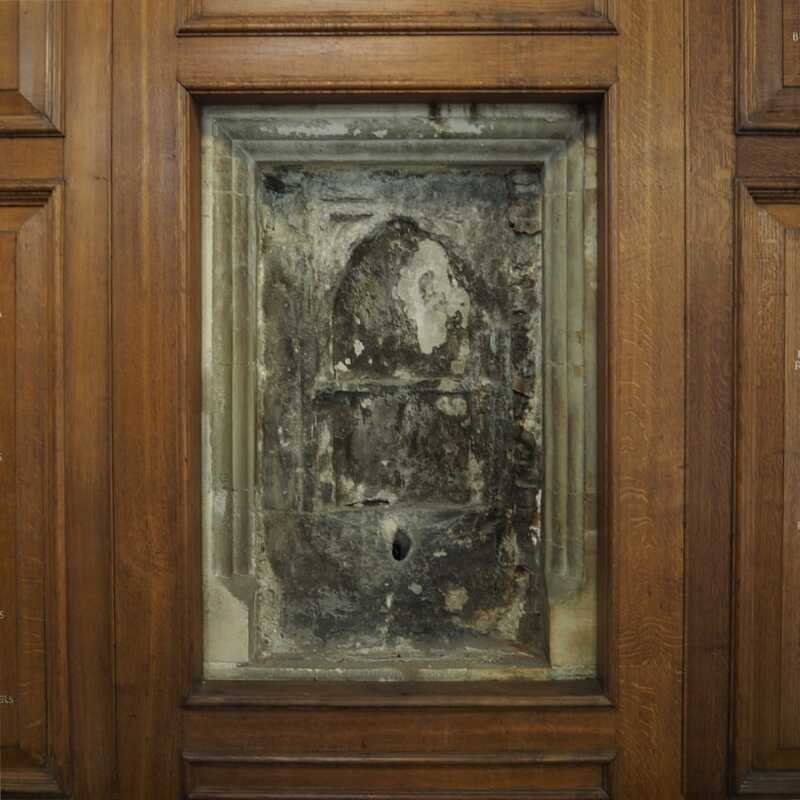 It’s part of a piscina (stone basin) which dates from the older St Sepulchre, pre-1666, and the blackened parts of the stone are reputedly scorch marks. 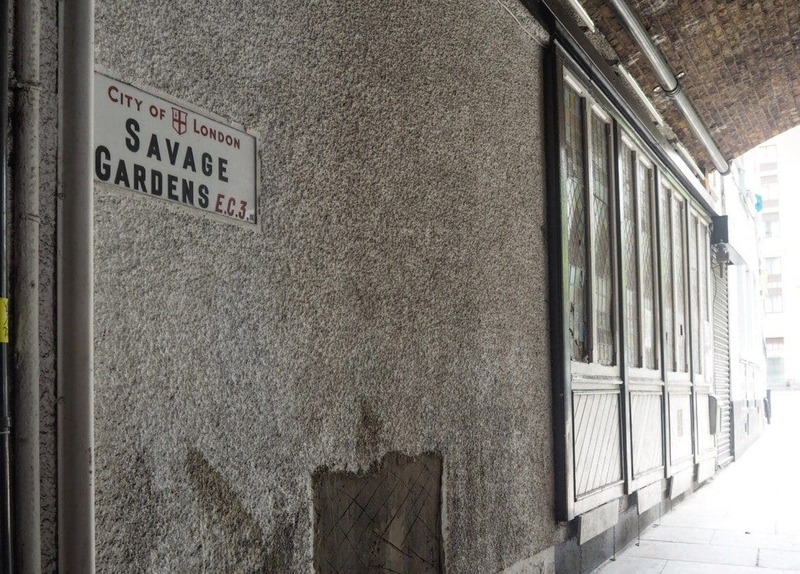 A stark reminder of the damage during the Great Fire of London. The fire itself stopped just around the corner from here on Giltspur Street and it’s worth taking a detour to spy the fat golden boy that today marks the spot. 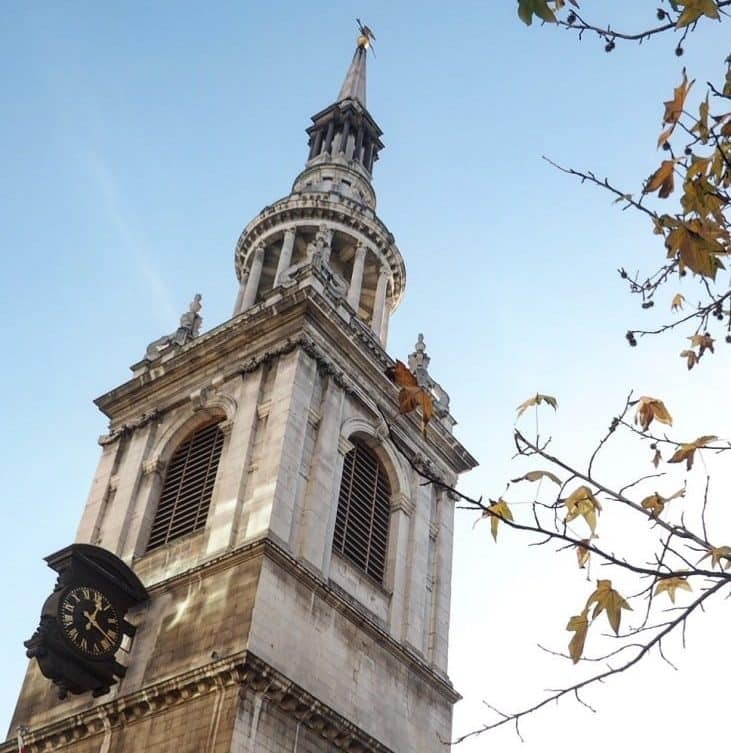 Still known as the Journalist’s Church because of it’s place on the ‘Street of Ink’, The Wren church of St Bride’s also has a romantic connection with its wedding cake shaped spire. The pastry chef Thomas Rich – while contemplating his upcoming marriage – designed a multi-tiered cake on the St Brides steeple. 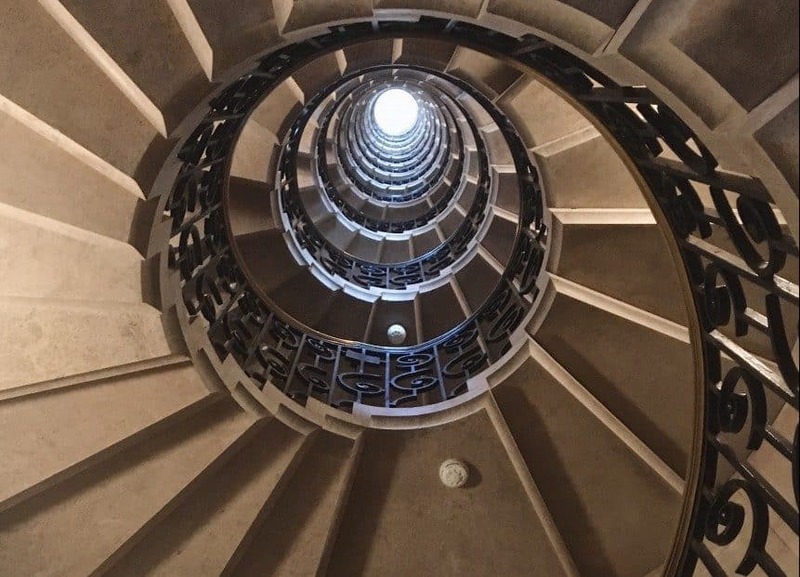 Until his death in 1811 he made a small fortune peddling cakes under its design! 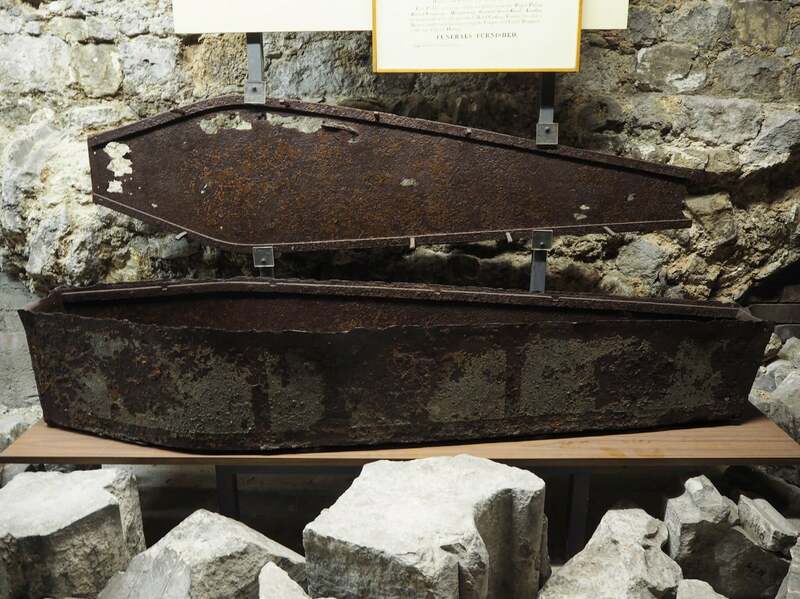 On display is an iron coffin. One that perfectly fulfils the specification of a patent issued in 1818 to Edward Bridgman. Bridgman has spotted a market in the 19th century for secure coffins, because ‘Ressurrectionists’; (body-snatchers) were rife at the time. 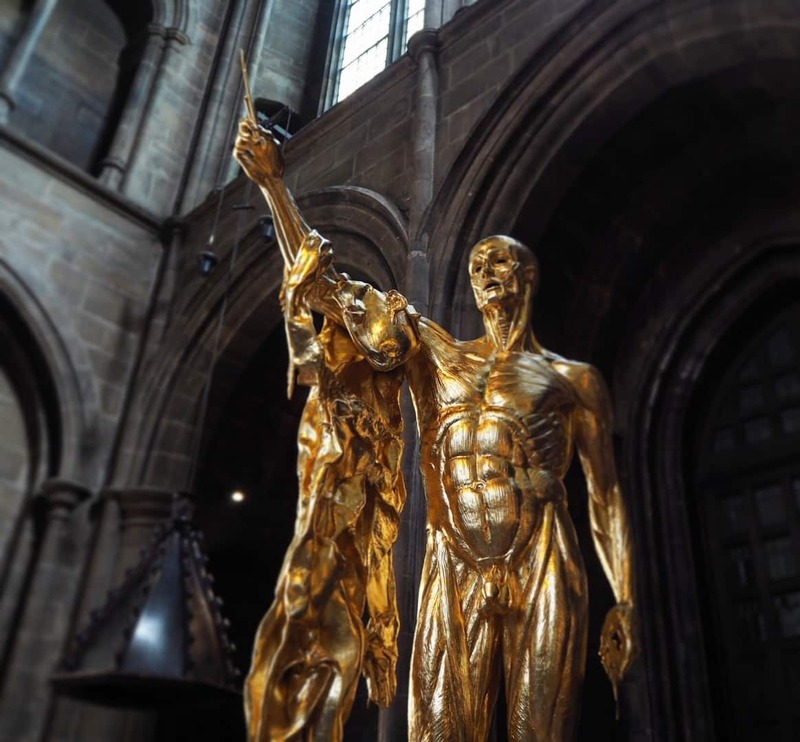 No god-fearing 19th century Londoner would choose to donate their body to science. It’s easy to miss St Magnus, surrounded by taller buildings casting their shadows across it. But if you cross the busy Lower Thames Street and walk under its portico, you’re essentially walking the route of the Old London Bridge. The Old Medieval Bridge was demolished in the 1830s, a few yards away from John Rennie’s new stone one. 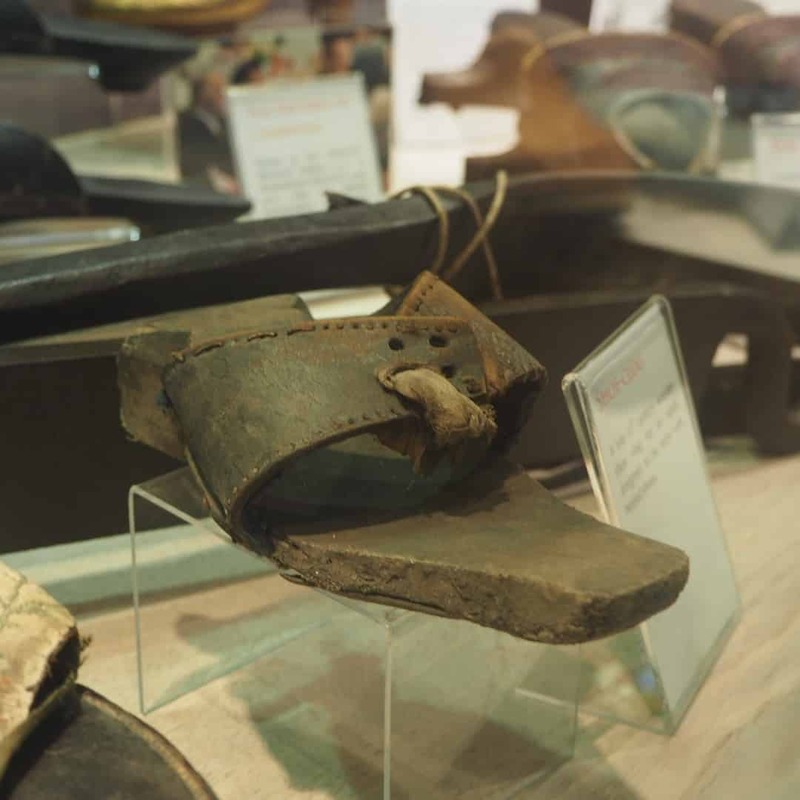 But older remnants can be found here, including a piece of wood from the Roman wharf (c. AD70) that was discovered in Fish Hill Street in the 1930s. 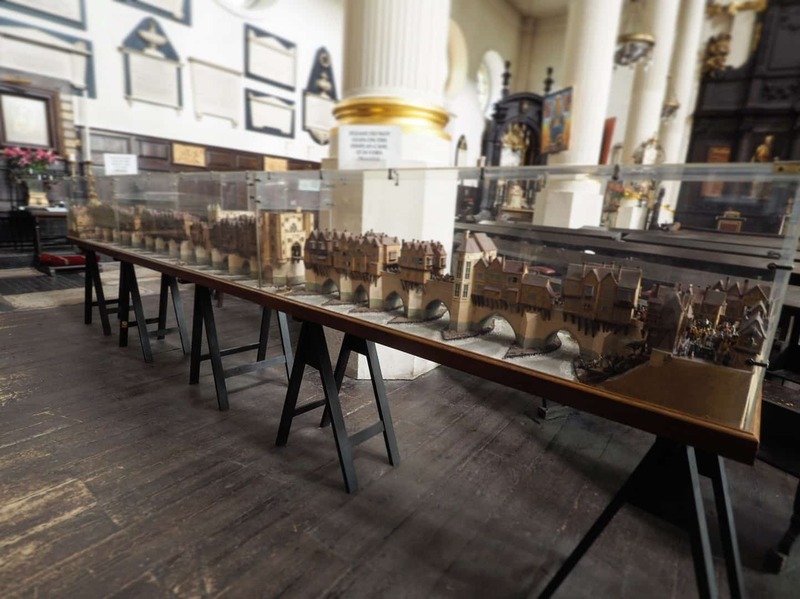 This model was made in 1987 by David T Aggett, a liveryman of the Worshipful Company of Plumbers. It shows the Old London Bridge as it appeared in the 1400s. 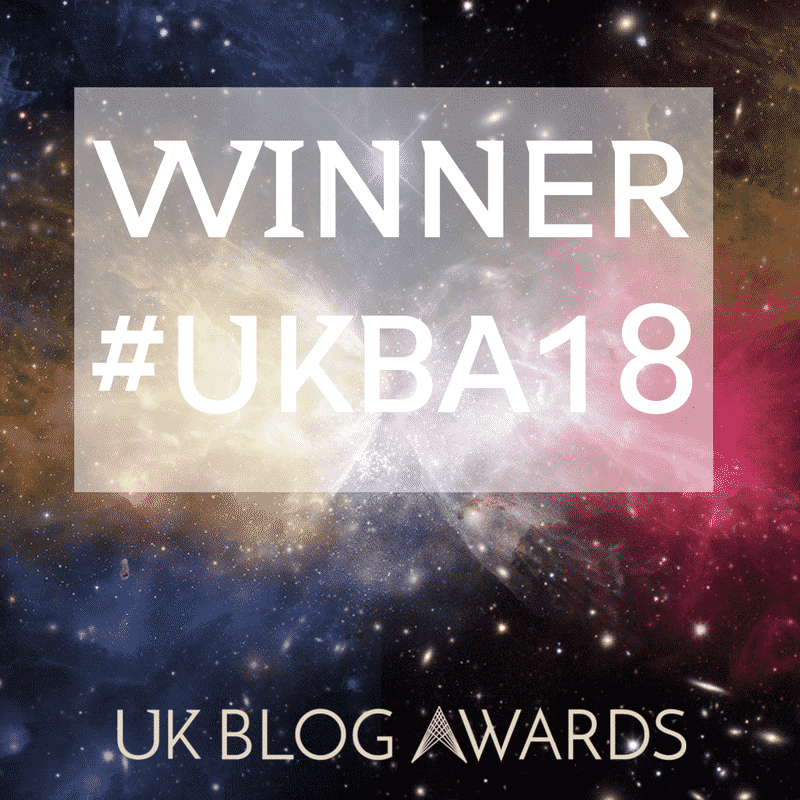 With a wealth of colourful characters to look at, have a closer look at the dedicated blog post here for all the info and detail. In the shadow of the Gherkin, this church isn’t normally open to the public, but if you ask nicely at the buzzer (as I did) they might allow you a quick look around! The modern refurbished interior lends itself to meetings and conferences today, but head to the far corner to spot an austere memorial. 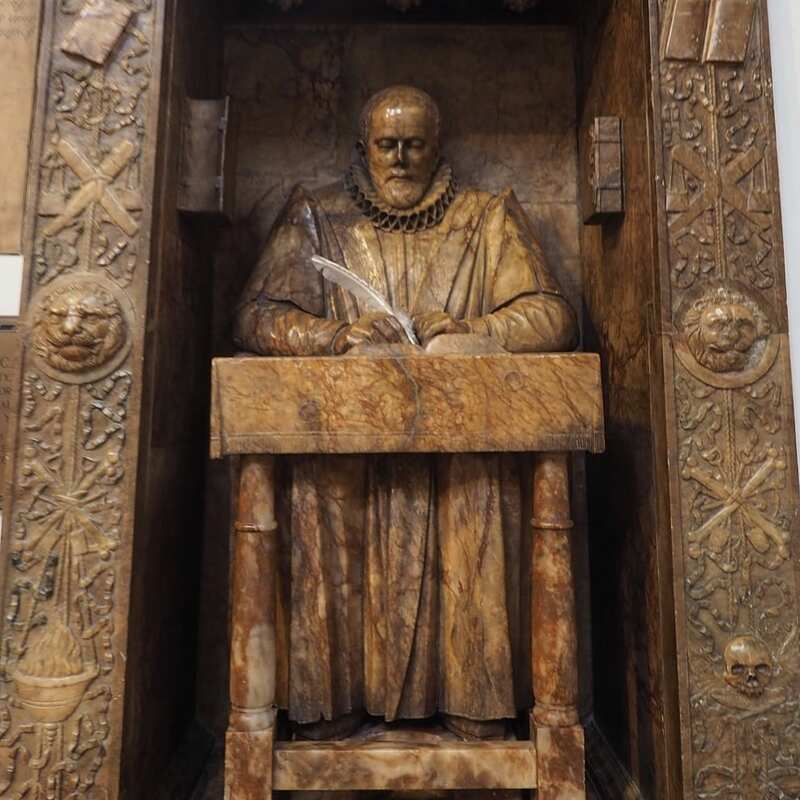 It depicts John Stow, a member of this parish who wrote the Survey of London (1598) – a fabulous insight into 16th Century London life. Look closely at the quill he’s holding. Every three years a member of the Merchant Taylor Livery Company replaces the quill in a ceremony. 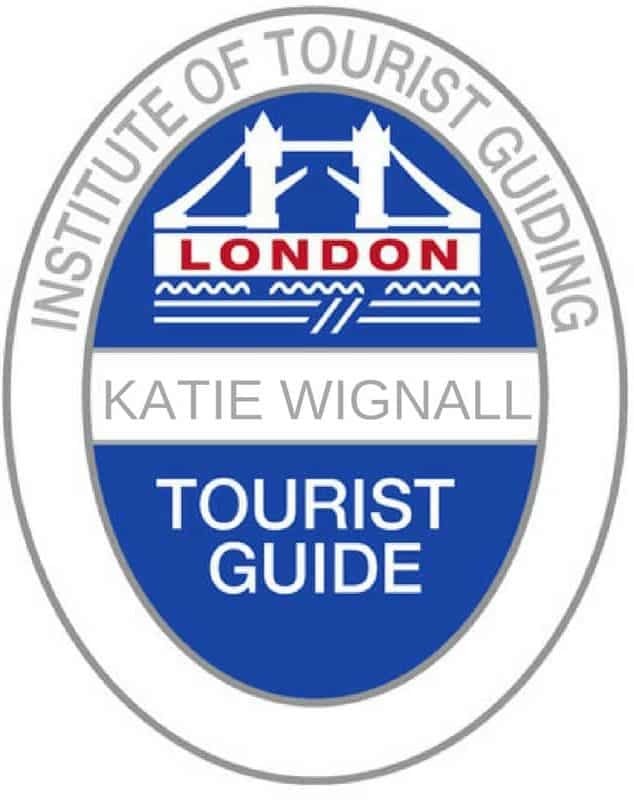 This one is very white and fresh because it was replaced on 24 April 2017. Curious about the name ‘Andrew Undershaft’? Find out why it got it here. 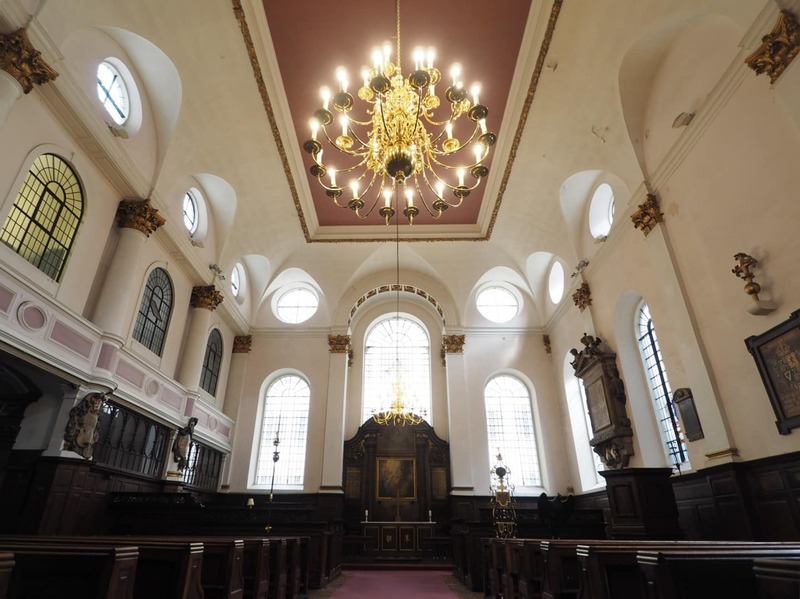 First recorded in the 12th century, it was rebuilt in 1538, destroyed in 1666 then rebuilt again by Wren. There was some slight damage in the Blitz and it reopened in 1956. 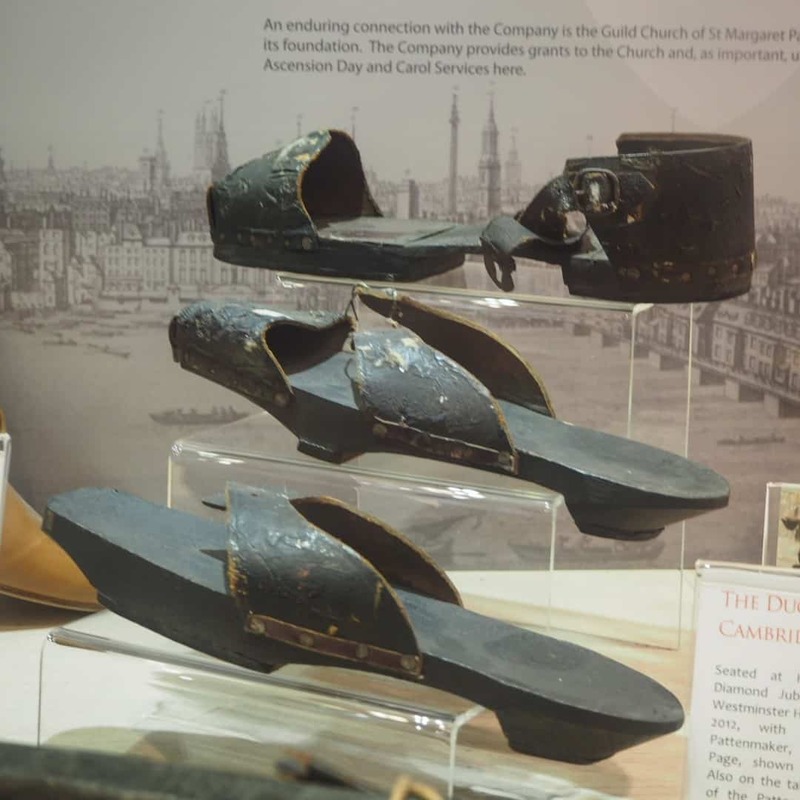 Found off Eastcheap, the curiously-named church relates to undershoes worn outdoors to keep the wearers feet and indoor shoes clean and dry. The left hand single patten dates from the 1600s while the three on the right are from c.1750. Despite not being used today, a Livery Company of Pattenmakers (first mentioned 1379) still exists. They used to be centred in Rood Lane next door to their guild church of St Margaret Pattens. 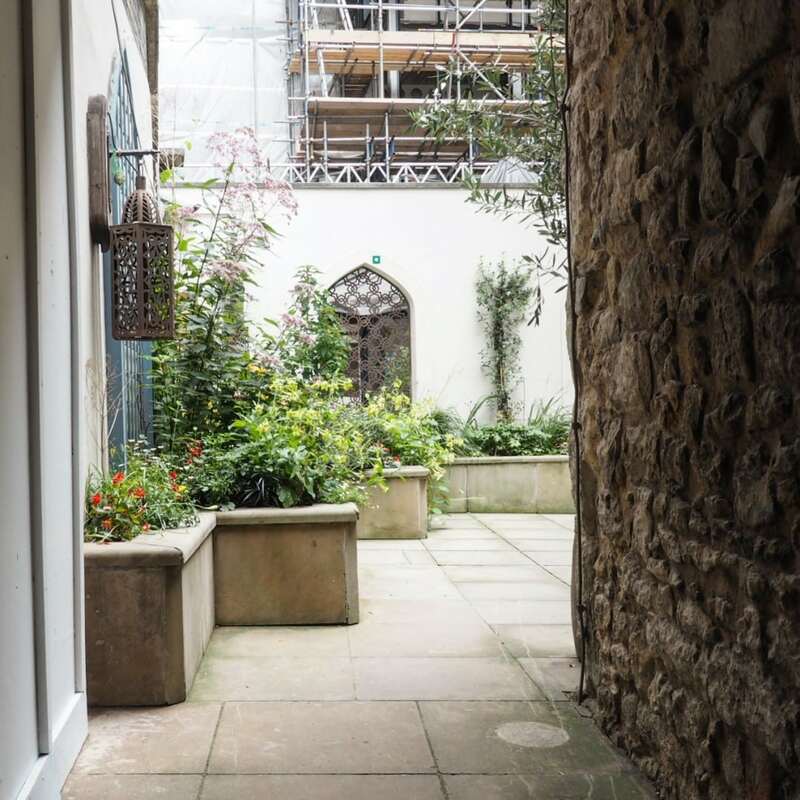 One of the best crypts in London to explore is only a stone’s throw from the Tower of London. 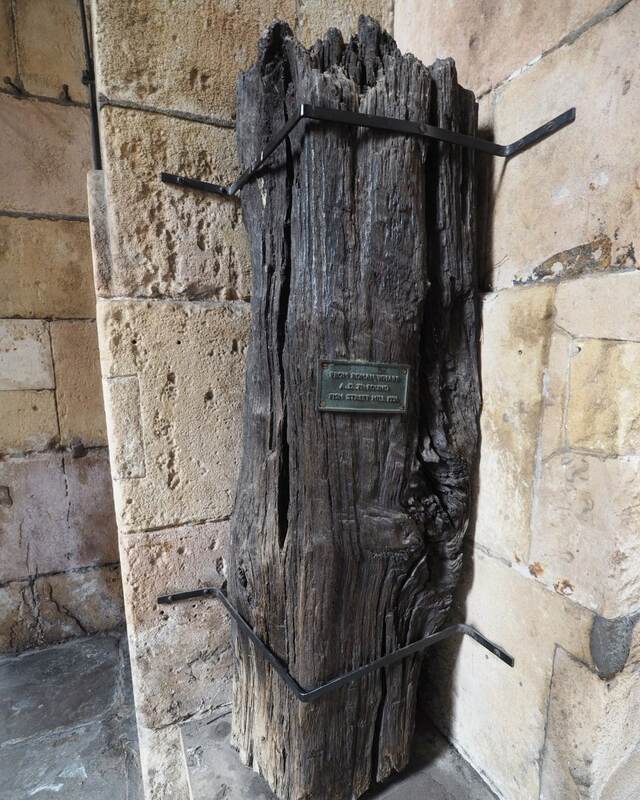 In fact the church foundations predate the Tower by 400 years! 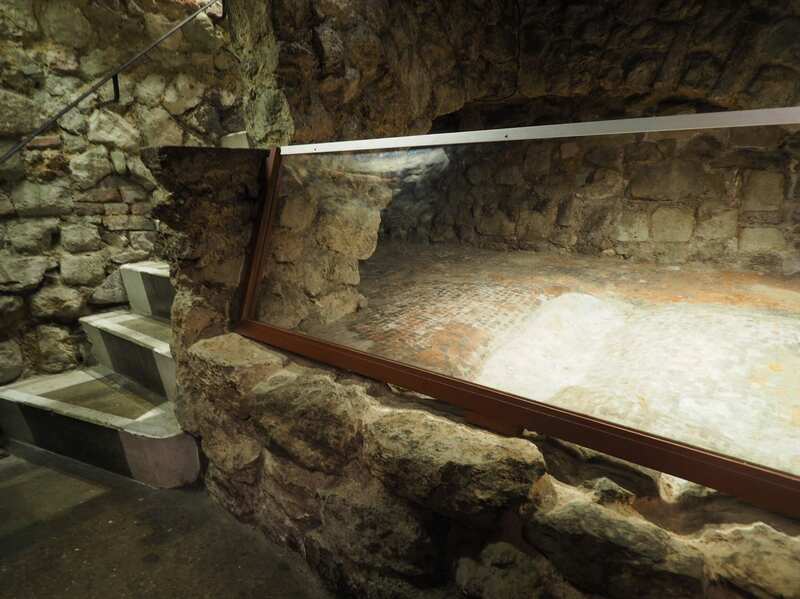 Firstly there’s the Roman survivor; a tessellated floor from a domestic house dating from the late 2nd Century. On the left is a collection of stone fragments showing Anglo Saxon knot designs, dating from 1000AD. 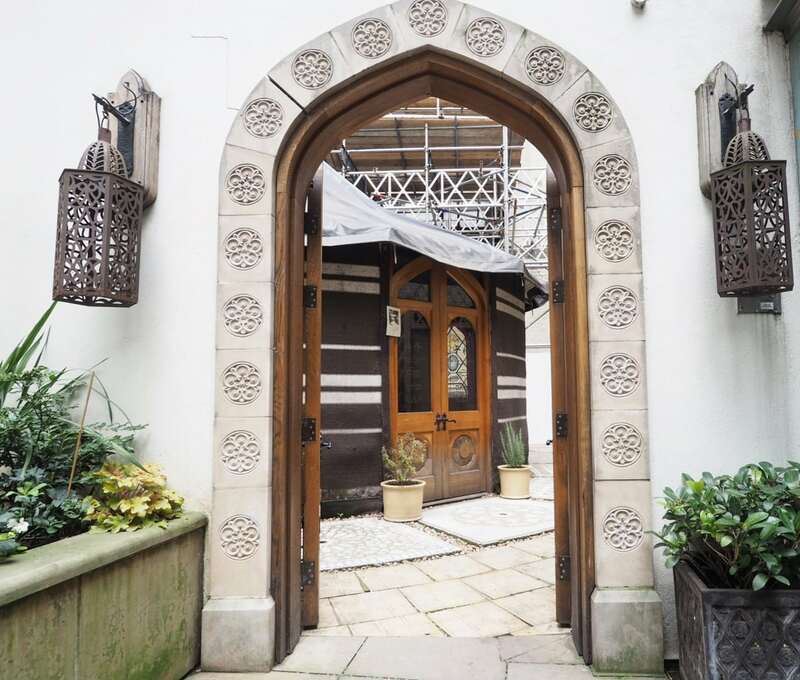 This smallest of the City churches on Bishopsgate is nonetheless full of surprises. 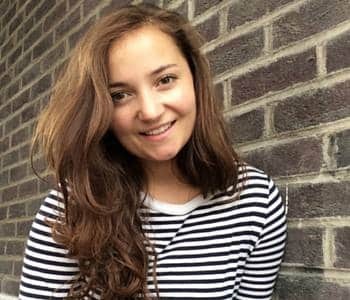 Firstly it gets it’s name from the 7th century leader of a monastic order, the first woman to ever lead one in England. She refused a marriage to a pagan prince so was banished to a nunnery by her brother c.650AD (hence the virgin part). Having survived minor damage in The Blitz, the church was targeted by an IRA bomb on 24 April 1993. The blast destroyed the church, injured 40 people and killed one man; a photographer named Edward Henty. 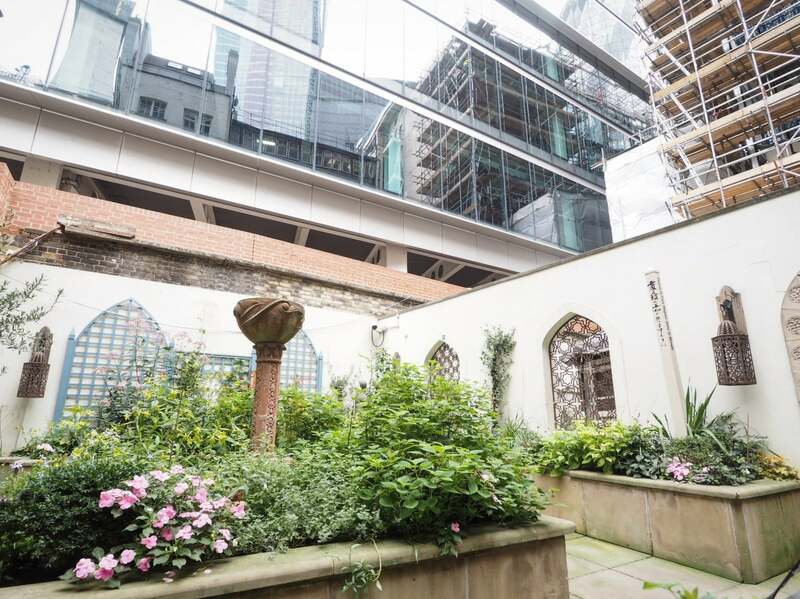 Despite being surrounded by City skyscrapers this little garden is peaceful and quiet spot in Liverpool Street. 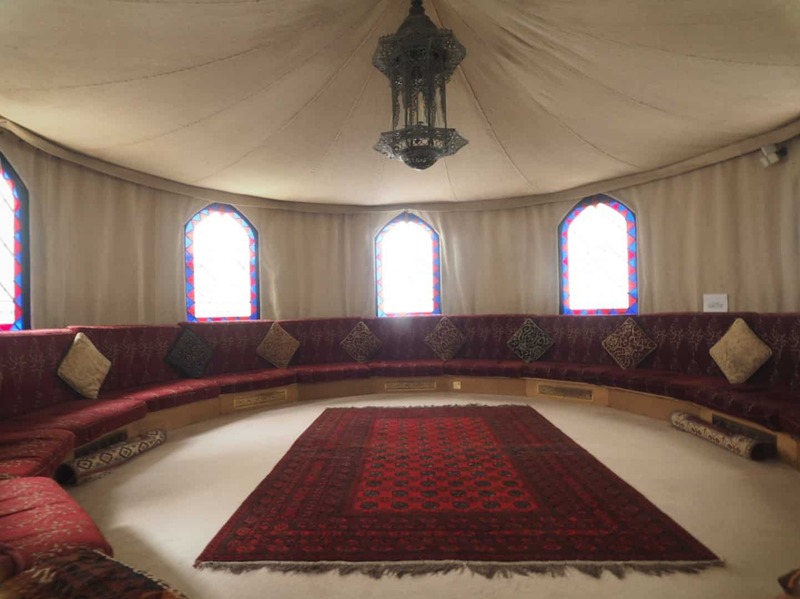 The pretty walled garden also houses a Bedouin tent for quiet contemplation.  When you discover it, you truly feel like London’s suddenly a thousand miles away! 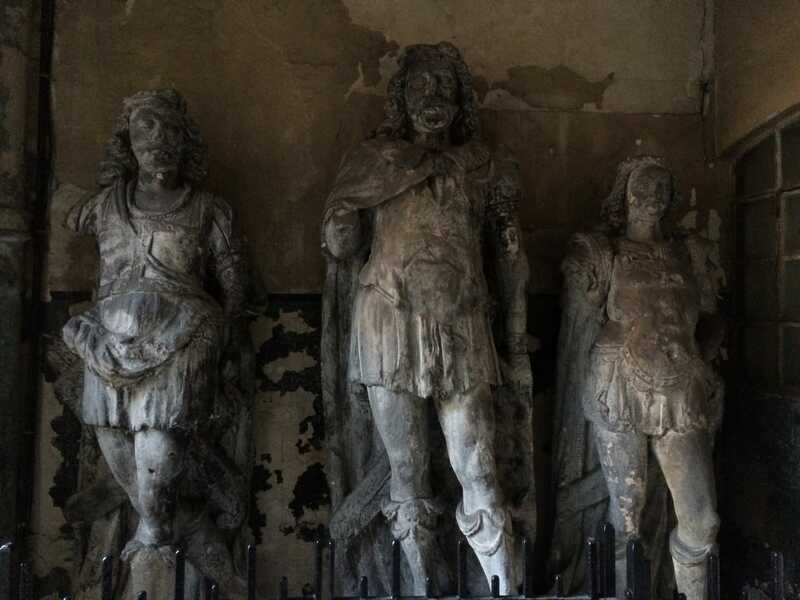 Despite a printed sign declaring these statues to be from the 14th century, this trio are more likely to date from the late 1500s because (like the Queen Elizabeth I statue from 1586 which stands on the outside wall above them) they decorated Lud Gate, a 16th century City entrance gate. 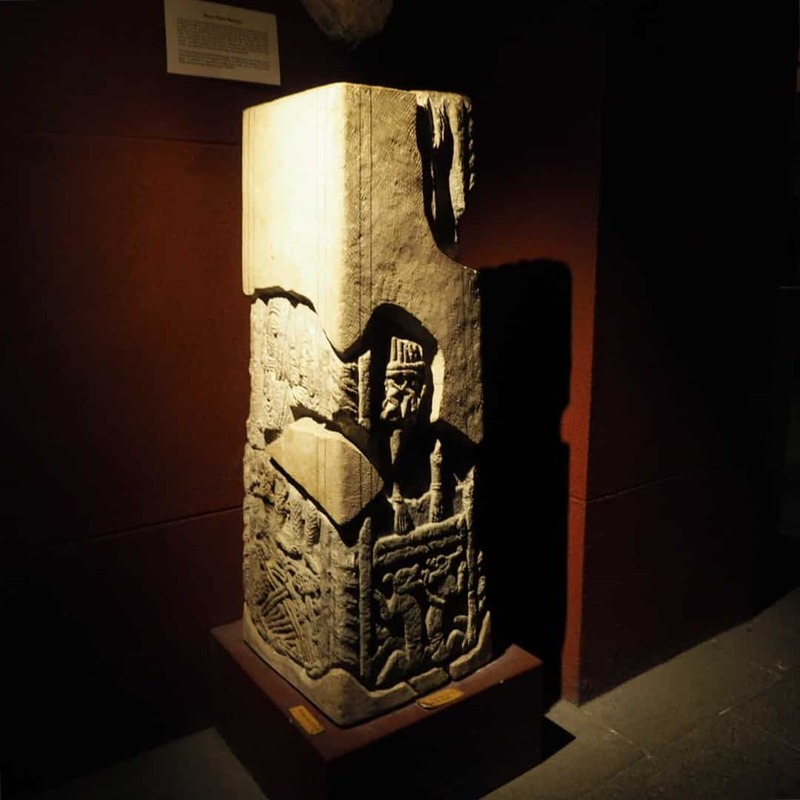 It shows King Lud and his sons, a Celtic King who ruled the area in pre-Roman times, who almost certainly is purely mythical. The gate which stood on Ludgate Hill, torn down in 1760. A plaque today still marks the spot where it stood. 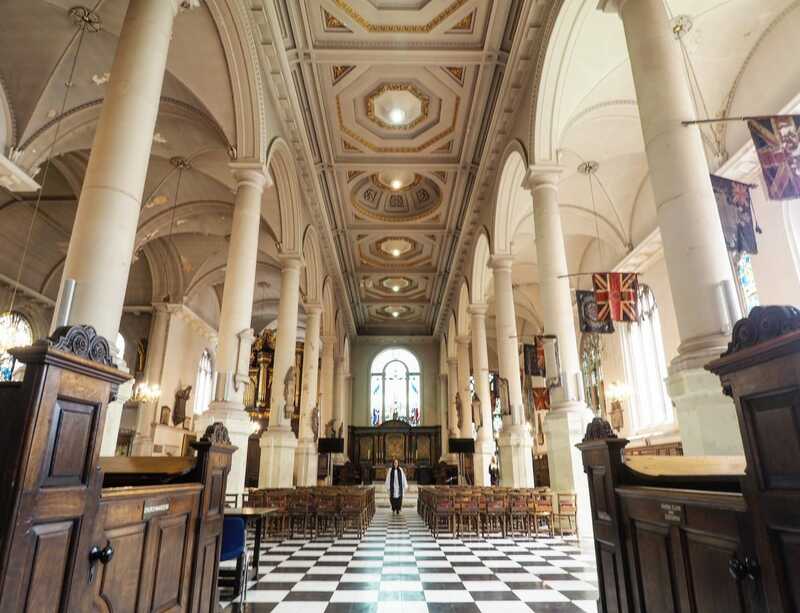 As an aside, the sister church St Dunstan in the East is also well worth seeking out. 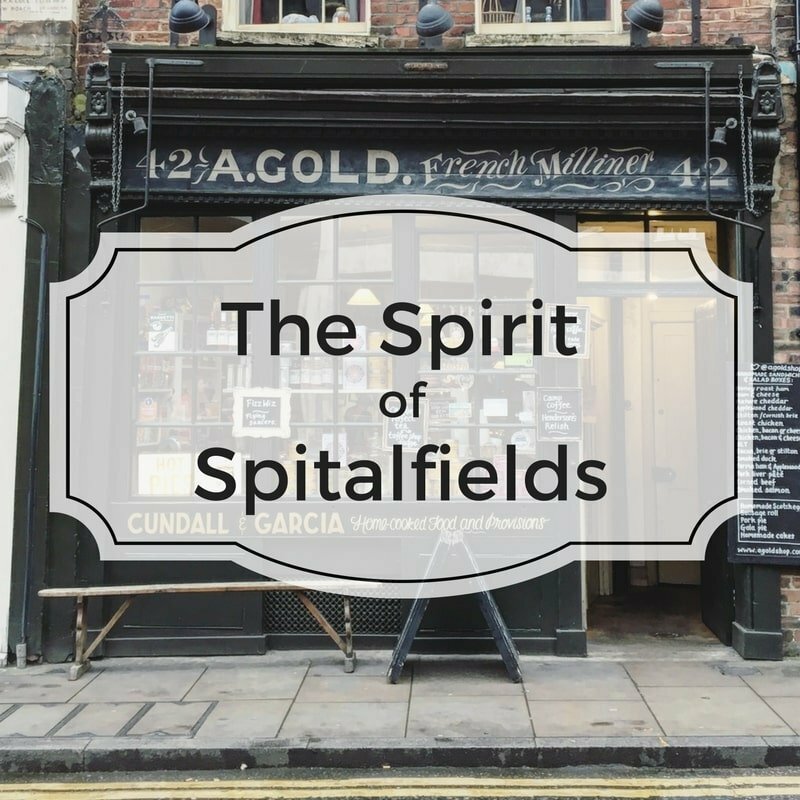 See more hidden gems of West Smithfield in my blog post here. This made the list purely for the intriguing name. It doesn’t reference a short-sighted Sister, but rather a piece of gender segregation. What appears to be a normal memorial, has several slits in its base. 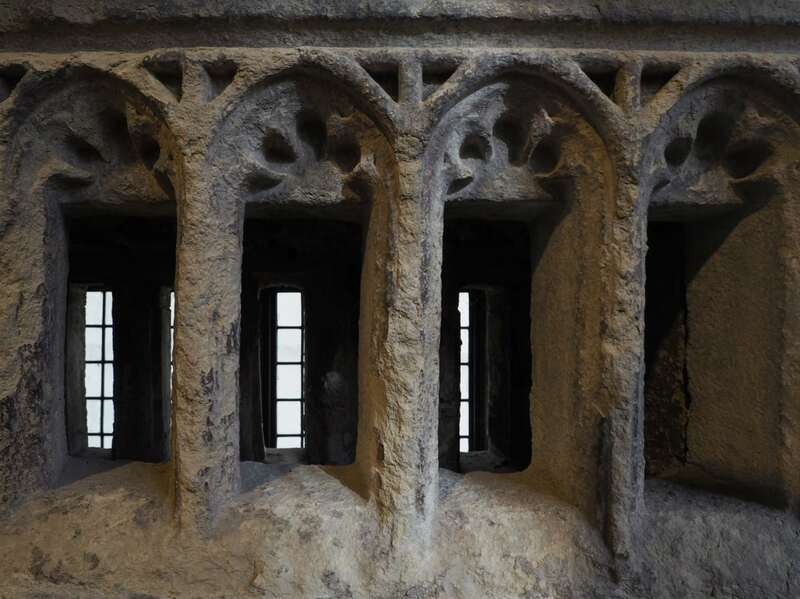 The angles of the slots meant nuns, not allowed to enter that part of the church, could still see the altar and therefore the mass. This shouldn’t give the impression they were wholly devout though. In 1385 there’s a record of the Dean of St Paul’s reprimanding the nuns for ‘winking over the screens’, wearing fancy veils, keeping pets and kissing secular persons! This warning didn’t seem to do the trick because in 1439 there was another criticism of their ‘dancing and revelling’ which was stamped out except at Christmas. Finally in 1538 the nunnery was closed, not because of bad behaviour, but simply part of the reformation land grab. It was eventually given to Thomas Cromwell’s adopted son William. I’ll accept that tombs certainly aren’t an unusual find in a church. But some have a bit more intrigue to them than most. 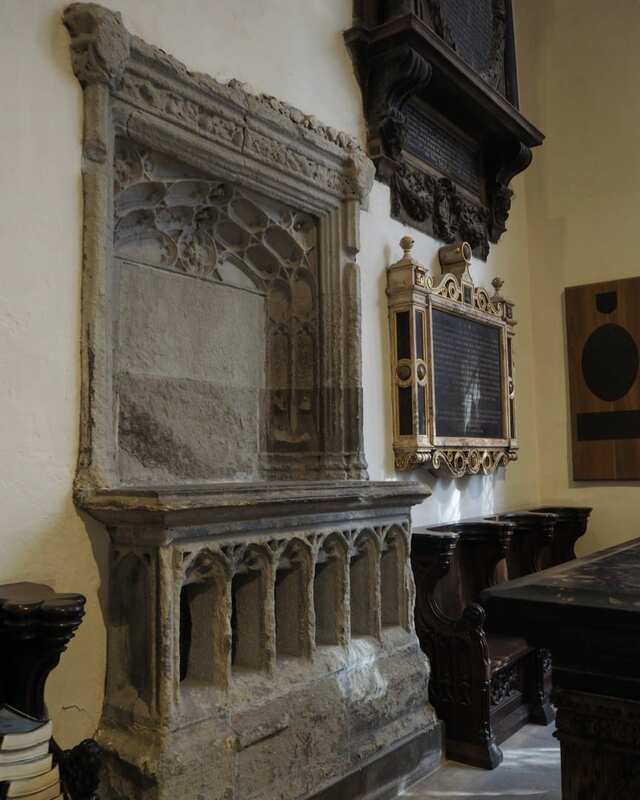 In the pictures below the left hand image shows the tomb of Sir William Pickering. 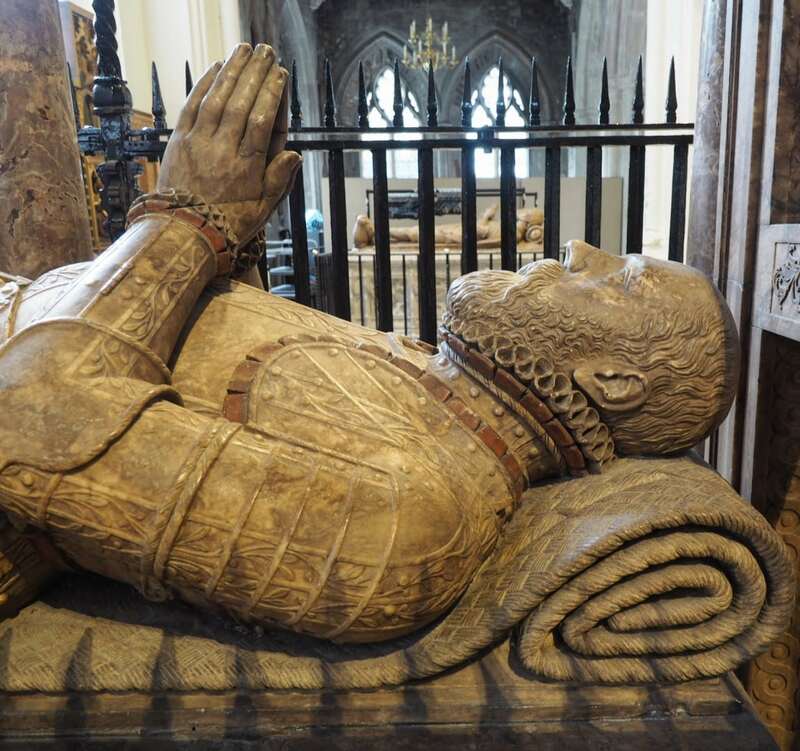 The elaborate tomb suggests he had some status in life. In fact he was ambassador to Spain under Elizabeth I. In contrast the right hand double tomb is the oldest in the church. 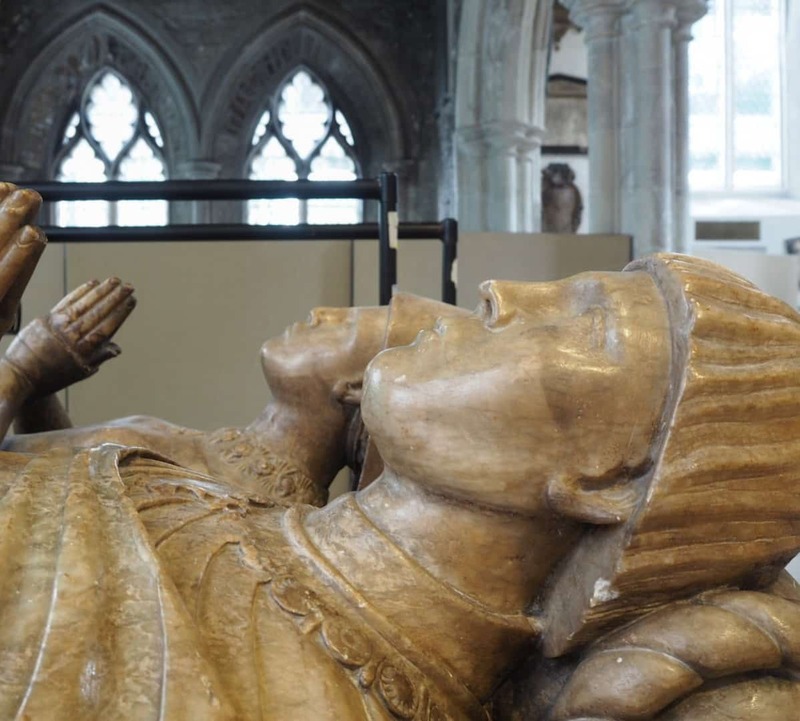 It’s John de Oteswich and his wife who died in the late 1300s! 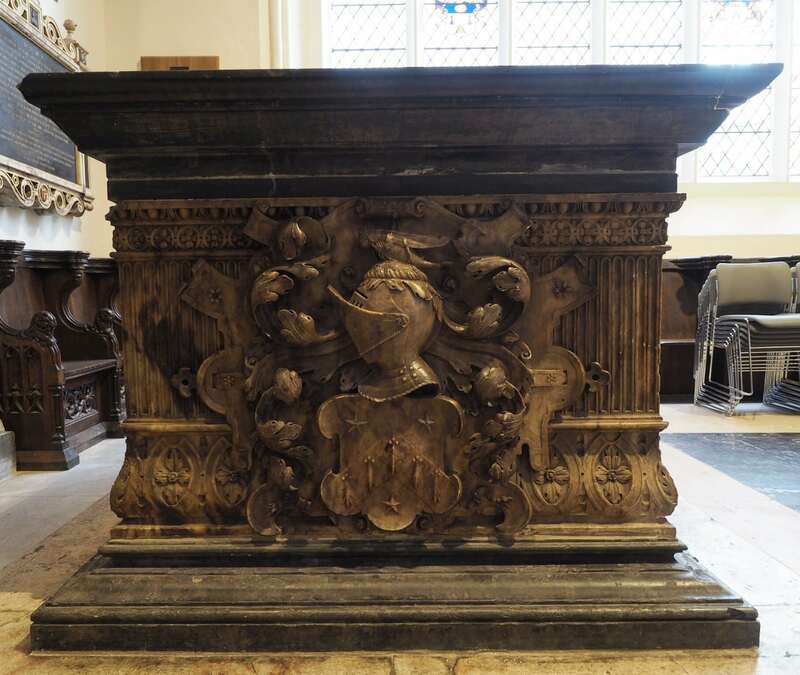 I couldn’t help but also include the tomb of Thomas Gresham (1579). A citizen and Mercer, Thomas Gresham established the Royal Exchange and was one of London’s most celebrated Tudor names. 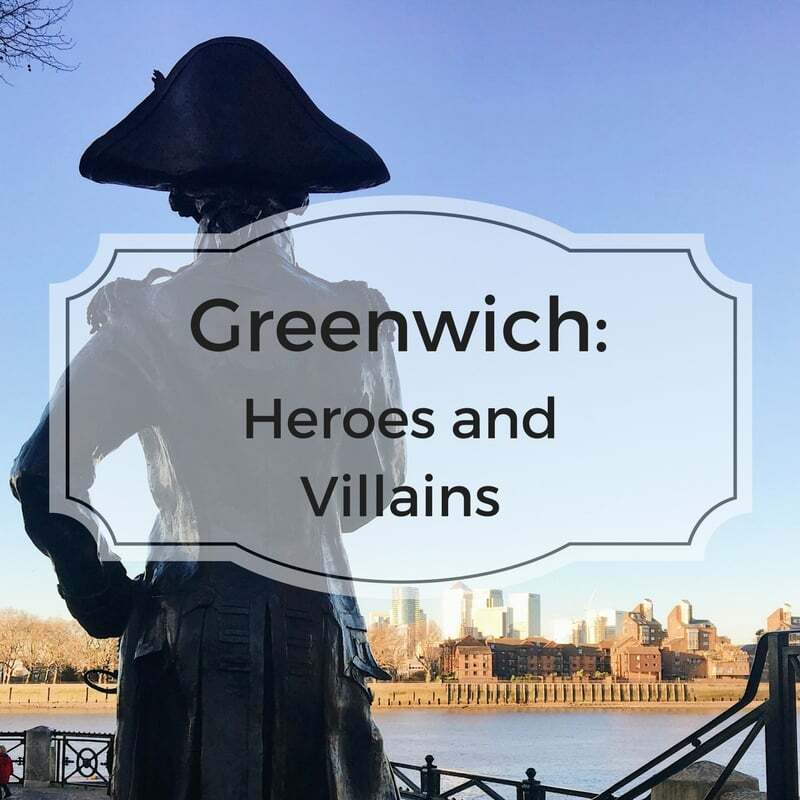 You can read about his legacy in Bank (and why there’s loads of grasshoppers in the City) here. Likewise it simply felt rude not to give William a mention. 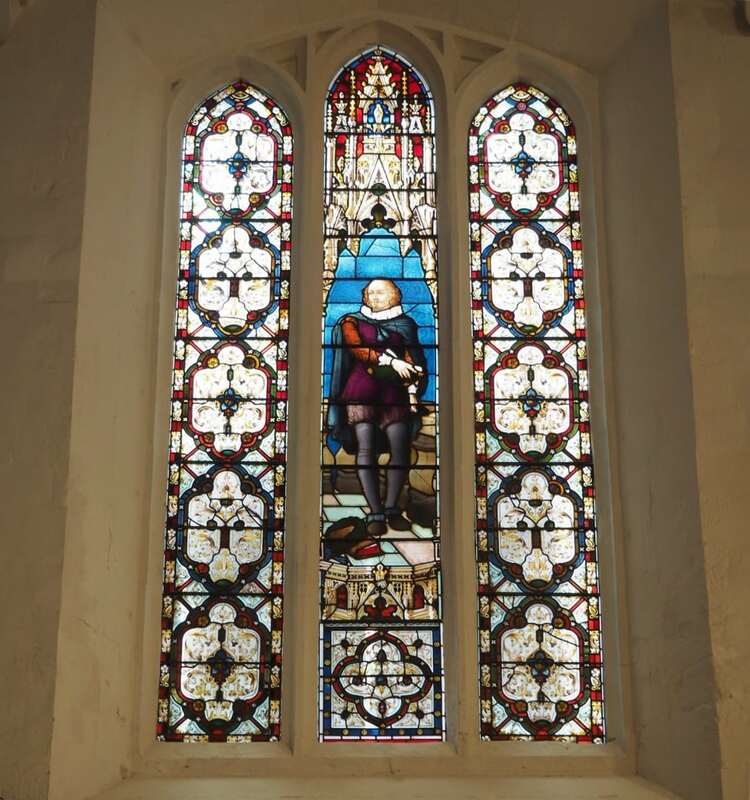 Though it only dates from Victorian times, this beautiful window remembers that the Bard lived in this parish, and would’ve visited this church, in the 1590s. 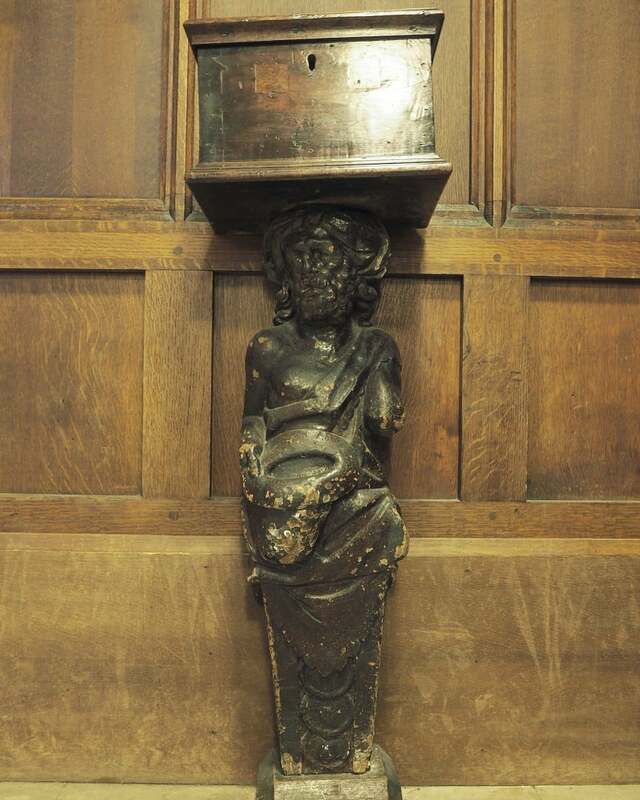 Dating from the 18th century the poor box is held up by a seventeenth century wooden figure. The bearded man plaintively holds out his hat, hoping for a bit of change in his secure head piece. After all this church exploration, I think we deserve a well-earned break. 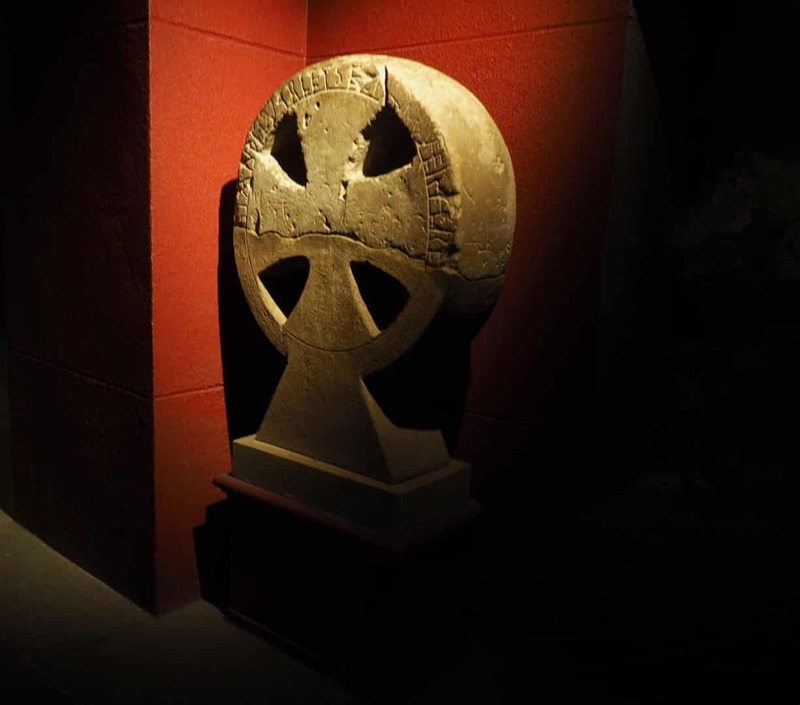 First recorded in the 12th century but with ancient origins. Make sure you look up at the huge dragon weather vane, it’s over 9ft in length! 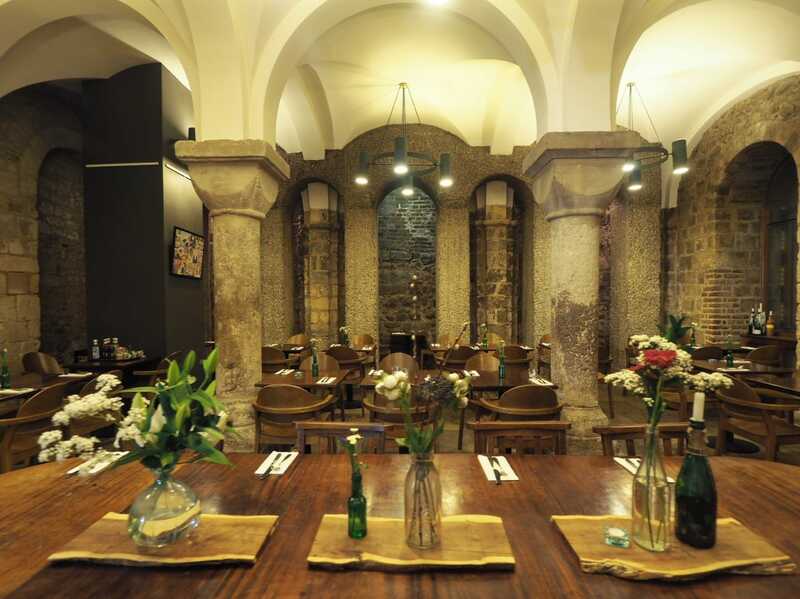 In the depths of this famous City Church is a delightful cafe, built into the 1,000 year old crypt. 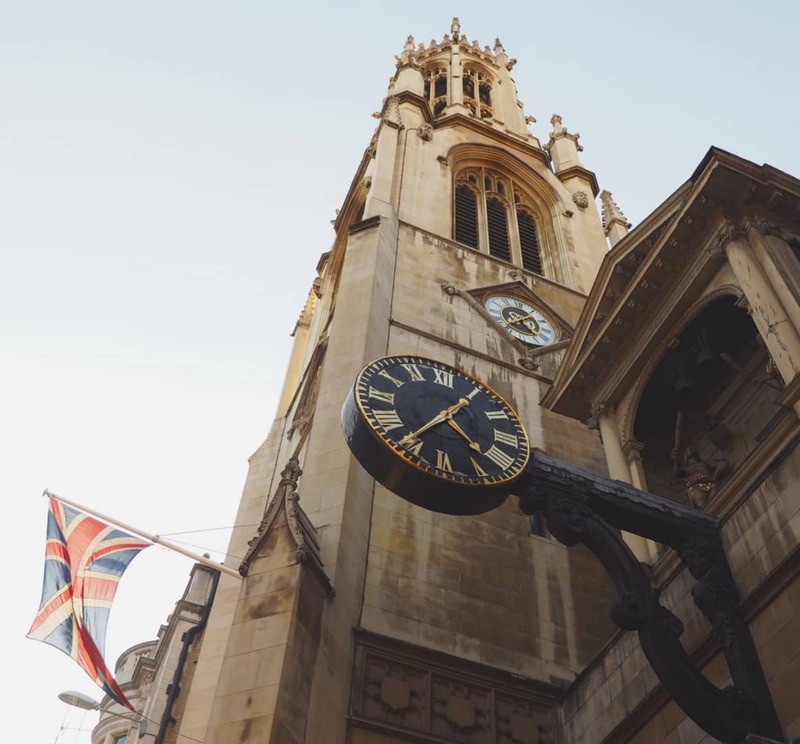 You can enjoy great food, coffee or something stronger from this family-run business and listen out for the famous Bow Bells while you put your feet up. 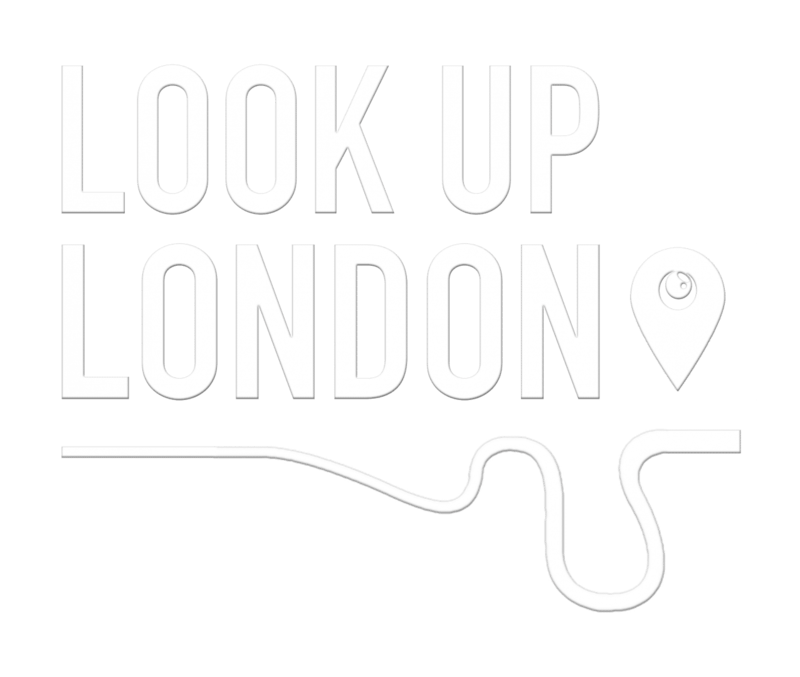 For more information an to book table, click here. 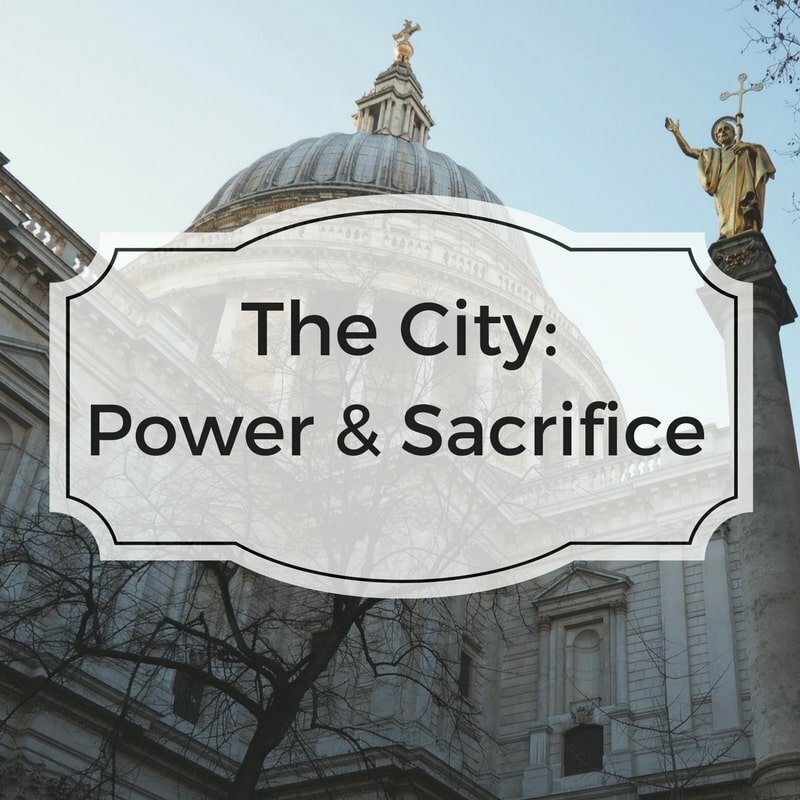 The churches of The City allow you to explore a tiny section of this historic epicentre of London. 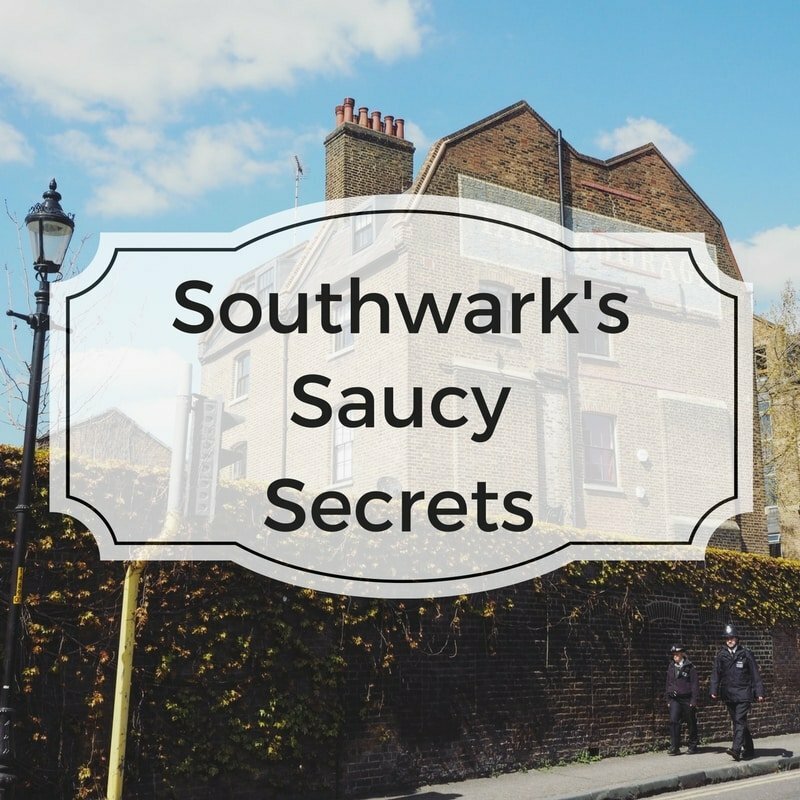 If you want to discover more secretes of the square mile, you can join me on a walking tour! 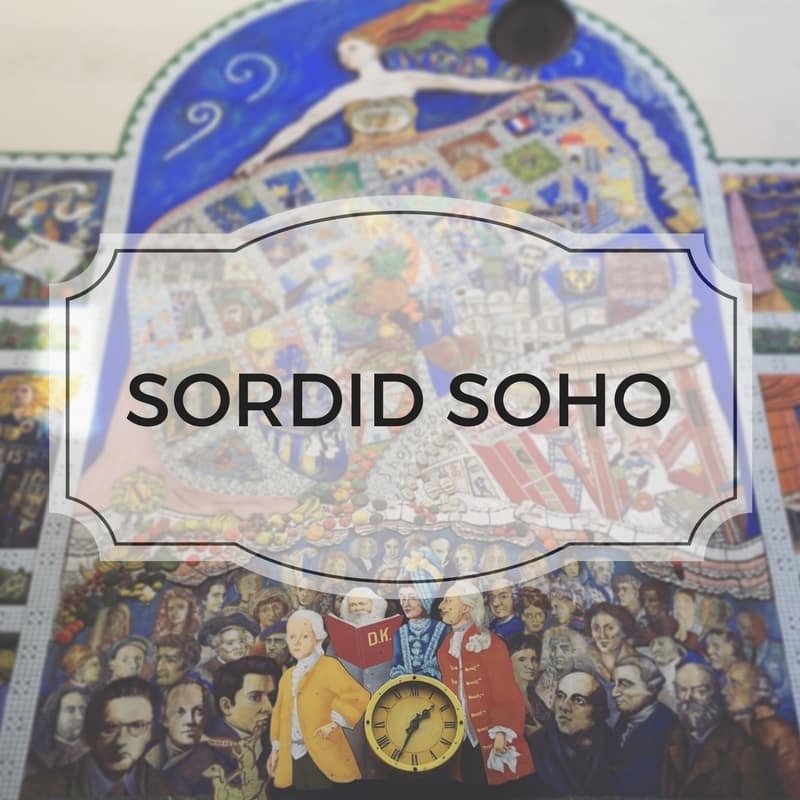 Find a date and book via eventbrite below, or read more about it here.